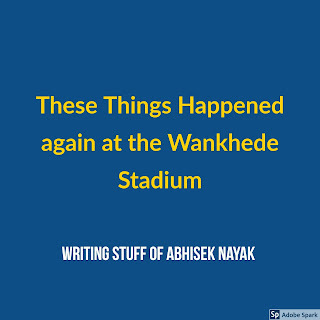 Again, Wankhede becomes Magical for the Batsmen in the 2nd Innings Since 2011 World Cup Final, It has been a tough task for the bowlers to resist the batsmen in the 2nd innings at Wankhede. In the 2011 World Cup final, India batted 2nd and was the better side, but the story was not same in yesterday’s match against New Zealand & the 2016 T20 world cup semi-finals against West Indies(now Windies). In both of the mentioned matches, India had good scores on the board but failed to defend it. The batsmen in the 2nd Innings were unstoppable in the 2nd Innings. Yeah, there were dropped chances, but the way it happens most of the times in Wankhede, it is magic for me. This magic may be the cause of the hot and humid conditions there, causing sweat in the fielders’ hands.